When it comes to web-based project management tools, we are spoiled for options these days. Popular ones include Asana, which coincidentally released its new iOS app today, Podio and Atlassian’s collaboration services. One lesser-known competitor is Wrike, a project management and collaboration service that raised $10 million from Bain Capital last year. The company is launching a major update to its service today that will allow it to compete with the likes of Asana even more effectively. As Wrike CEO and founder Andrew Filev likes to point out, he believes that the devil is always in the details when it comes to getting these kinds of services right. One thing his team realized, for example, was that Wrike’s users spend most of their time either in email, doing online research or using specific tools for tasks like marketing automation. With this update, the company is trying to tie all of these different tasks back into Wrike with the help of a clever Chrome extension that lets users annotate the web. 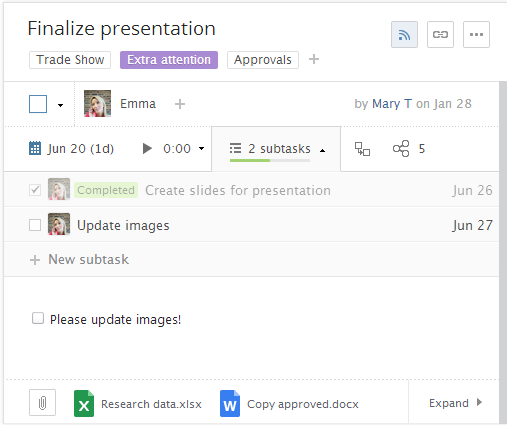 Using the extension, Wrike users can not only pull in information from any website, but more importantly, when other team members land on that site, they will see that there are tasks associated with it. In a way, this is similar to web annotation tools, but none of those have ever had much impact, likely because they weren’t integrated into any other productivity applications. Other new features include the ability to include outside parties to Wrike projects, something the company argues is especially important for agencies that work with their clients. The Wrike team notes that it worked hard to make sure that users from outside a given company can’t get access to any information outside of the project they are involved in. Wrike is also now integrated with Zapier, the IFTTT-like service for automating the interaction between different web apps. With this, Wrike users can now easily create a setup that pulls data from tools like Evernote or Zendesk into their workspaces.